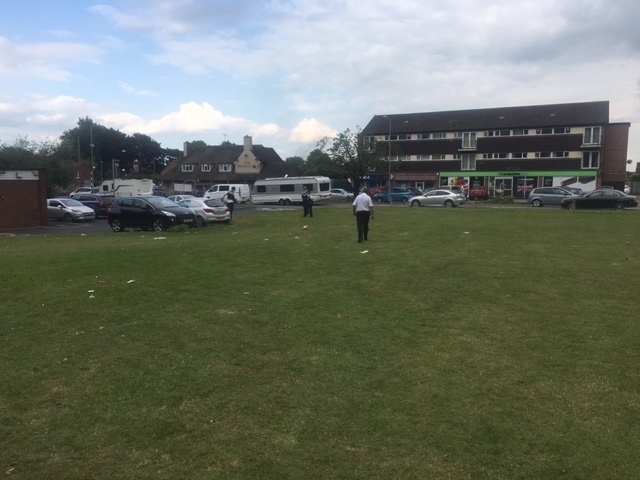 Last week we received an instruction from Stafford Borough Council to remove around 14 caravans that had arrived on playing fields off Holmcroft Road in Stafford. We immediately deployed five of our enforcement officers to the site to find caravans, RV’s and associated vehicles occupying the land. Upon arrival it quickly became apparent that the travellers were aggressive and confrontational, stating that they would resist eviction with force if necessary. Our lead officer advised if they did not leave voluntarily a tow truck would be deployed to the site to remove all caravans. To avoid the situation escalating it was agreed that the travellers could have until midday to leave. Council officials and police officers then left the site agreeing to return at midday. Unfortunately by midday they had not left so a tow-truck arrived on site which prompted the travellers to leave albeit not withstanding threats made to our officers including a traveller wielding a machete/large knife. The travellers had all been removed by 17:00 the same day leaving behind a quantity of rubbish and other items including a childs inflatable paddling pool believed to have been taken from a nearby resident’s garden. Council staff began an immediate clear up operation that saw the site cleared and fit for normal use by 18:30.